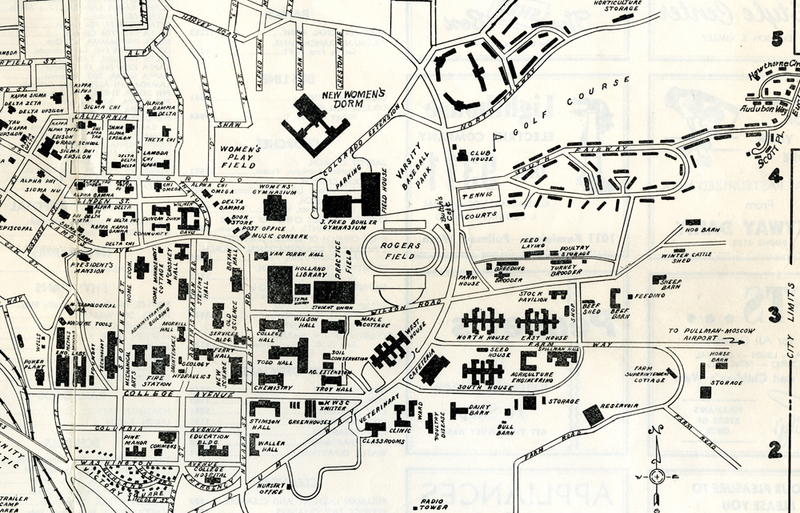 This is a brief chronological history of many of the WSU (Pullman campus) buildings. The majority of the buildings included here are of interest due to age, usage, or historical interest; the university has owned a number of barns, sheds, and other buildings generally held to be of lesser interest, and most of those are not included herein. 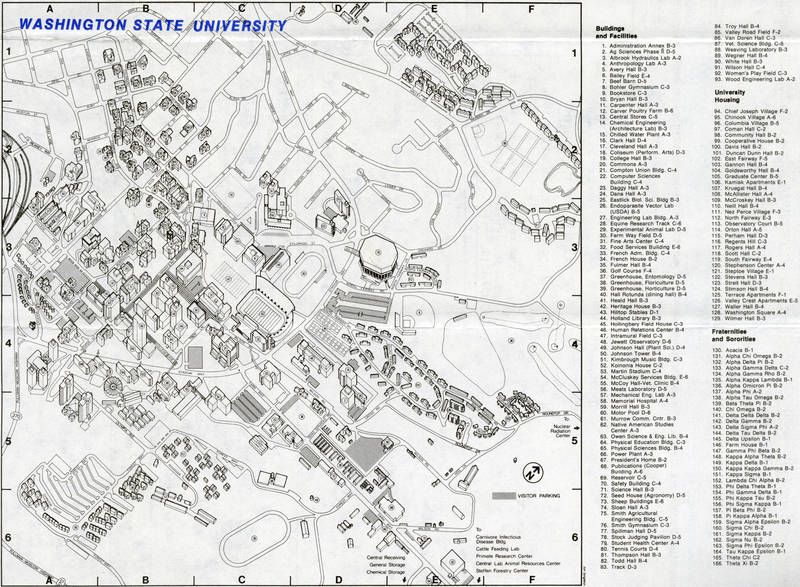 The parenthetical number after each building is an official WSU Building identifier; these link to a composite of Archival holdings on those buildings (note that that function is primarily intended for internal Archives use, and a number of those records are sealed). This first college building was a one-story, 36 feet by 60 feet brick structure. It cost $1,533.50 and stood on the site of the west end of its replacement, the TUB ([Old] Women's Gymnasium). It originally housed agricultural and biological laboratories, plus a museum. When the TUB was built in 1901 the Crib was incorporated into that, integrated into that building. While the TUB was torn down in 1954, the Crib-portion of it was torn down a few years earlier, in September of 1947. Architect: Herman Preusse. Construction on this building was begun in February of '92, one month after the opening of the college. It was a five-story brick building costing $45,000, 104 feet in length with a frontage of fifty-seven feet, "heated with steam and lighted by electricity." Contractors were Taylor and Lauder; the architect was Herman Preusse. Starting about 1:30 AM on Tuesday, November 23rd, 1897, a fire destroyed Old Ferry; and the present Ferry Hall was built on the same site in 1899-1900. Named for Elisha P Ferry, first governor of Washington state. Construction on this 48' x 70' two-story frame building was begun in June 1892, on the site of the present Murrow Hall; the building contained classrooms, the chemical laboratory, the library, and offices. One description places the color of the building as "fire-engine red." In 1899 it was removed to the ground now occupied by Bryan Hall, to make room for Science Hall [later Murrow]. Its end came in the second half of 1907 when its wood construction frame structure was razed ahead of the building of Bryan Hall. This College Hall should not be confused with the current College Hall, which was not built until 1908. Architect: Herman Preusse. This was a $20,000 frame structure erected east of Ferry Hall. It was 28 feet by 40 feet. It served its original purpose for one year and in 1893 was converted into a gymnasium for the students. It was apparently torn down in 1902 or 1903 after the completion of the Gymnasium/Armory (the TUB). Built at 78 x 92 feet. Referred to as Mechanical Shops. A 30x70 foot forge shop and foundry were added during 1899, and a connected new Heat, Light, and Power Plant was built then as well. 100x16 ft, with a small 16x30 potting shed at one end. The old forcing house was made part of the structure. Several greenhouses would be attached in the coming decade; an Insectary was added in 1916. Located approximately where Todd Hall and the Todd Addition would later be built. Thompson Hall is the oldest extant building on campus, designed by noted Seattle architect, James Stephen and his Chicago trained partner, Timotheus Josenhans. Their firm was selected over 16 other entries in an architectural competition held by the Board of Regents. Thompson Hall was constructed for less than $50,000 using local red brick made from clay deposits in back of what is now Stevens Hall. It was placed on the National Register of Historic Places in 1972, and renamed Albert W. Thompson Hall on April 15th, 1972 (it was originally known simply as the Administration Building). Thompson served as Dean of Humanities in the College of Sciences and Arts. Until 1968, it served as the Administration Building as well as housing a number of other university functions. It is prominently sited and immediately identifiable by its two large towers, one truncated and one with a conical roof. The romantic Victorian Romanesque character of the building is further enhanced by a rich variety of windows and entryways and the use of rock-faced granite (quarried near Spokane) for its contrasting trim. It was rightly described by the Regents at the June 26th, 1895 dedication as "an excellent piece of work and one that in point of convenience, strength, and architectural beauty compares with any state building." Today, it has been extensively remodeled inside, but the exterior remains largely intact. It was most recently renovated at a cost of $7,600,000, and rededicated on September 23, 2000. It is one of WSU's most notable buildings, an excellent example of an early ideal in educational architecture. A commonly told story is that the building's second tower remains uncompleted because the construction contracts of the day left a loophole whereby the college did not have to pay the state for the building until it was completed, and by leaving one tower unfinished, the school never had to pay that money. This is, however, untrue. Original plans called for one of the two towers to end in a platform, and an October 6th, 1893 Pullman Tribune article about the early stages of construction notes that "of the two towers in the building one terminates with a deck to receive the meteorological instruments." The WSU Veterans Memorial, located just just of Thompson Hall, was dedicated on November 11, 1993 and cost $150,000. Heat, Light, and Power Plant built at base of hill near railroad tracks. Repurposed as Mining Building in 1899 after a new Heat, Light, and Power Plant was built, connected to Mechanical Hall. It was condemened and abandoned in 1917. Located "between the Barn and the college campus" (the Barn was due east of campus, probably in the vicinity of what is now the Alumni Centre). It burned in August, 1901. Architects: Stephen and Josenhans. National Register of Historic Places, 1978; Stevens Hall Historic Landmark Dedication on November 8th, 1980. The oldest operating residence hall west of the Mississippi. This was the first women's dormitory. Formerly the boys and girls had been quartered on separate floors in Old Ferry. The building was constructed in the summer of 1895 at a cost of $20,000. Named for Isaac I. Stevens, first governor of Washington territory. Port Cochere removed in 1945. Stevens Hall is the oldest dormitory and second oldest building still standing on campus. It is named after Isaac Stevens, first territorial governor. Aside from a year-long closure for rehabilitation work in 1958, the resilience hall has been in continuous use since its completion. Its design is an eclectic combination of several styles including Queen Anne, Colonial Revival, and Shingle. It possesses irregular massing, multiple gabled and gambrel roof formations, and a rich interplay of wall surfaces. It was constructed for less than $20,000 out of brick manufactured from clay deposits on the site, local basalt, Puget Sound fir and red cedar shingles. Enclosure of the second floor solarium and replacement of the wood shingles of the roof and upper wall surfaces have compromised its architectural integrity, but have not lessened the importance of Stevens Hall to the historic development of the campus. In addition to its primary function as a residence hall, it served as the early social center of the campus, the site of receptions, state conventions, and annual dinners for faculty and administrators. It remains a dignified, yet unpretentious, reminder of the campus formative years. The 80 foot high Old Stack was originally the chimney for the Heat, Light and Power Plant which was built at the foot of College hill. When the plant was converted to the Mining Building in 1899, the Stack, or Totem Pole, was annexed by the students who painted their class numerals on it. Although these numerals were painted as early as 1900 succeeding classes blotted them out until 1906 when a truce was arrived at and it was agreed that every class would be allowed to paint its numerals on the Stack without fear of having them molested. Danger of its falling caused college officials to have the Old Stack razed on August 9th, 1935. 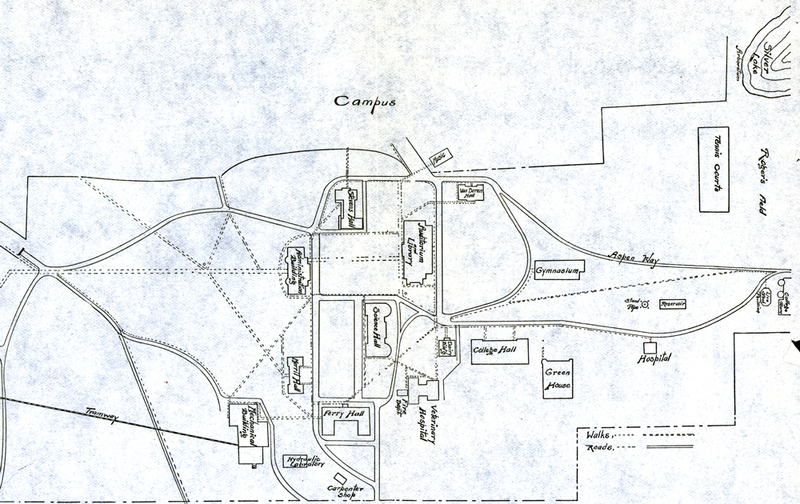 In 1899, the college purchased six acres north of the athletic fields. A small earthen dam was placed at the lower end of the Sweetwater Valley (now the parking lots south of Beasley), and natural springs located where Beasley Coliseum now is resulted in the creation of Silver Lake, also known as Lake DePuddle or the Tanglewoods, where Mooberry track is now located. The lake was filled in in 1929 to allow the construction of the Hollingbery Fieldhouse. As related under the story of Old Ferry, the new building was constructed in 1899-1900, on the same site. It cost $440,000; the architect was George Bullard. The Hall was first occupied in early February, 1900. The building was taken down on May 8th, 1975. A last artifact of Ferry Hall still exists in the form of the Gazebo near the Alumni Center (moved there from near Murrow Hall in 2008), which was the old bell tower. Architect: George Bullard. Built at cost of $60,000, dedicated June 20th, 1900. Originally Science Hall, it was built to serve the biological sciences and geology, to house the museum and provide a temporary home for the Departments of Agriculture, Horticulture and Veterinary Science. The third floor of the south wing was used for three college literary societies. Elevated seats, removed in 1964, were located in a large semi-circular room on the south wing of the first floor for observation of veterinary clinics and animal husbandry demonstrations. Its science functions were taken over by a new Science building in about 1935, after which it became Arts Hall. Renamed after distinguished journalist and WSU alumni Edward R. Murrow and officially dedicated on April 28, 1973 in conjunction with the first Edward R. Murrow Symposium in Communication. By the 1960s it was home of WSU's Radio and Television Services. Transmitter and studios of KWSC-TV in building; antenna atop Bryan Hall tower. Collegiate training in radio broadcasting began at WSU; KWSC is one of the oldest of educational broadcasting stations. Like several early buildings, it has double hung windows with straight lintels on lower floors and arched heads on the upper level. Its design is simple and restrained, but it gains its interest from the projecting bow fronted wings on either end of the east facade facing "Hello Walk." An interesting detail is to be seen in the original rainwater heads, which have been preserved. On the west side, the former main entrance is obscured by the somewhat overwhelming Murrow Communications Building of 1972. The southern greenhouse was originally added in Spring of 1920. The original Murrow Hall and that newer Murrow Communications Building (1972), both connected by an upper level walkway, were commonly referred to as Murrow East and Murrow West, respectively. "Murrow West" became Jackson Hall in 2014. Attached to the Mechanical Building, this was the new Heat, Light, and Power Plant (replacing the one built in 1893); this became the Fire Station between 1935 and 1942 after the College Avenue Steam Plant was built in 1935. Ca. 1963, graduate students in Fine Arts used this as studios, and were overjoyed with the space after operating the previous year in an abandoned bowling alley downtown with no heat. Maintenance shops moved to Shops Wing of McCluskey Hall in 1963. Demolished summer 1971 to make room for Daggy Hall. Architects: [Timotheus] Josenhans and [Norris B.] Allen. Although construction on this building began in 1901 it was not completed and furnished until 1903. Dedicated June 16, 1903; it was originally the Chemistry Building. Named for Senator Justin S. Morrill, whose 1862 Act of Congress provided basic law under which State College came into existence as a land grant institution. Cost, $33,000. Ca. 1960s, it housed the Police Science and Geology Departments. It was originally built as a chemistry laboratory (known then as the Chemistry Building) and has served many functions since. As the fourth oldest building on campus, it helped establish the tradition of dignified red brick buildings at WSU. Standing on a basalt plinth, its facade is organized by a series of piers and arches rising through two stories. The double hung windows with arched heads on the second floor are recessed between the piers. Under the eaves is an elaborate arrangement of projecting courses and blind arches. The $1,975,000 rehabilitation of Morrill Hall in 1981 was carried out with great care. The wood windows were retained and the structural work required to bring it up to the standards required by the Seismic Code was skillfully done. First built as a gymnasium for both men and women, serving as such until 1928 when the Bohler Gymnasium was completed and the men moved there. Cost, $10,000. Its official opening ceremony was held on January 10th, 1902. It incorporated the Crib into itself when it was built, though the Crib portion was torn down in Spetember of 1947. Through time, the TUB was known as the Gymnasium, the Women's Gymnasium, the ROTC Armory, the Bookstore, the Student Recreation Center, and the Temporary Union Building (TUB). It was razed in June of 1954. 52 x 40 feet. Built in summer of 1903; directly west of future location of College Hall. From 1917 to 1935 this served as the Mining Building. It was razed in late May, 1936, to allow the university to continue what would later be named as Library Road down to College Avenue. First non-veterinary hospital. Originally known just as "the Cottage," and soon referred to as the Sanatorium. Built in fall of 1903 and opened in January of 1904. Razed Sept. 25th, 1961. Located on current location of Art Museum (formerly Safety Building), just east of Wilson Hall. Also known as the Stock Pavilion. This should not be confused with the Livestock Judging Pavilion (later remodeled as the Ensminger Pavilion) which was built in 1933. When that newer Pavilion was approved in early 1933, it was determined that this current Livestock Pavilion should be torn down, that apparently happened somewhere between 1933 and 1935. A four-room, one-story building to take care of the immediate classroom need was constructed just north or south of the future site of the 1908 Hydraulic Laboratory (itself later the Math Learning Annex). Converted to carpenter shops in 1909, and razed in 1910. This somewhat gaudy-looking fountain stood south of Bryan Hall; it was built with money left over from the 1905-1906 Chinooks. It was removed in 1932. Architects: J.K. Dow & C.Z. Hubbell. The growing importance of veterinary science necessitated the construction of a separate classroom and hospital building. It cost $11,000. Built as the Veterinary Building, which provided for surgery and other animal hospital facilities, it later became Old Veterinary Building, then Counseling/Career Services Building (Services Building); named Administrative Annex (or Ad. Annex) in 1963. Reworked in 1964 for projected $609,000. Torn down in 2009. The structure went through a series of functional use over the years, which included university administration offices and building and grounds services. Ad Annex was one of the oldest structures within the historic campus core. Its scale complemented the open space to the north of its main entrance. Its modest mass created a compatible edge to this significant open space located at the western end of the CUB Mall further enclosed by Murrow East and Bryan Hall. Architect: J.K. Dow & Clarence Z. Hubbell. Cost, $25,000. This building was first constructed for the Home Economics courses as the Domestic Economy Building. At the time, it was the only building dedicated entirely to this discipline west of Chicago. It was later named for Mrs. Nancy L. Van Doren, preceptress, professor of English, and librarian at the start of the college. It was the first campus building named for a woman. It housed Music in 1960s before that moved to Kimbrough. Van Doren is a significant building within the historic campus core, which defines the northern edge of the original quadrangle east of Bryan Hall. This building follows an unusual combination of styles and detailing in comparison to the other historic structures, making it a unique example within the core. The Flemish bond pattern of yellow and maroon brick, with the mixing of medieval with Italianate design style, creates an interesting architectural statement. At one time the scale of Van Doren was more in balance with its spatial surroundings. Today, however, the mass of Holland Library is somewhat over-powering and the original sense of scale has been lost. Built at cost of $12,000. Originally known as the Hydraulics Building or Hydraulics Laboratory; not to be confused with subsequent Albrook Hydraulics Laboratory. Later Chemical Engineering (ca. 1980), later the Multicultural Center. The architect for this building is something of a mystery. According to Engineering professor James Woodburn in 1931, the building was designed by student Neil McNamara (class of 1910), under the supervision of Prof. Osmar Waller. However, it appears more likely that McNamara designed the interior laboratory arrangement. 1907 regents notes say that planning for this (and several other buildings) was to be given to JK Dow of Spokane, but the original blueprints lack the promnient JK Dow monograms found on blueprints for the other buildings that he designed. The Hydraulic Building was designed as a plain two-story brick structure with many windows and a sloping roof at the center of which was a square cupola. The cupola served as an extension roof and cover for the stand pipe 45 feet high which regulates the flow of water in the hydraulics laboratory. This building is valuable as the only remaining example of the simple, small-scale structures from the early days of the campus. With its basalt base, red brick walls and hipped roof, it conforms to well established WSU traditions. The only elaboration is in projecting brick courses on the first floor walls, which give relief to their surface. Yet it is a fine example of an unpretentious building of real architectural quality. The excellent proportions and human scale are reminiscent of Georgian architecture. It is well related in scale and complements a foil to its neighbor Morrill Hall. It provides a satisfying counterpoint to its more modern neighbors. The Farm Barn, later the College Barn, Dairy Barn, or Horse Barn, was completed in late 1908. In 1909, it was expanded by the addition of two wings to the rear of it. The Barn would be intentionally razed by fire in late Spring of 1946, to allow Stadium Way to be connected through. The number of campus barns with similar names make it difficult to track individual barns with certainty, but a photo of this as a "New Barn" can be found in the 1908-12-18 Pullman Herald. In post-1909 pictures, the shape of the Farm Barn is very similar to the shape of the Beef Cattle Barns (1922-1924 and 1925-; the latter would become the Lewis Alumni Centre), which leads it to be photographically mistaken for those better known barns. They are easy to tell apart, however - the Farm Barn is dark in color, while the Beef Cattle Barns are quite light in color. The College Farm House, on the right in this picture, was built in 1892. It has to have been removed somewhere between 1952 and 1958, most likely 1957. Architect: J.K. Dow. Dedicated on June 9th, 1909. The Auditorium and Library Building was erected on the second site of old College Hall at a total cost of $130,000. Despite tales that the clock was not installed until 1912, it can be seen in the 1910-1911 yearbook. The clockfaces were lit in December of 1946. The chimes were apparently installed in summer of 1948. The building was named in honor of Dr. E.A. Bryan, president emeritus of the college, by the board of regents on May 12, 1916. Circa the 1960s it was headquarters for Department of Speech and some faculty of Department of Music. Bryan Hall, built in 1909, is symbolically the dominant structure of the historic campus core. Originally built as the principal library and assembly hall, it commemorates Dr. E. A. Bryan, who was president from 1893 to 1916 and was responsible for the development of WSU to a major educational institution. It was designed by the leading Spokane architect, John K. Dow, who followed traditions already established at WSU, yet gave the building an individual character. This highly eclectic building is not dominated by a single style. The broad bracketed eaves, the round arched windows link it with the Italianate Style. The tall clock tower is clearly related to the Italian Campanile. However, it would be reasonable to see this as a unique and imaginative structure. Particularly fine is the elaborate bracketing under the eaves which may even have resulted from an oriental inspiration. The building was remodeled in 1973-1974. Architect: J.K. Dow. Dedicated on June 9th, 1909. Erected at a cost of 115,000, the New Recitation building gave much needed classroom space for liberal arts studies. Ca. 1963 this was home of the College of Pharmacy, and part of the English Department. Built under President Bryan as the 'Recitation Hall' in the same year as Bryan Hall, this building further demonstrates Bryan's contribution to the university. Both buildings were designed by J. K. Dow, one of the more distinguished of the architects who worked here. However, College Hall is more restrained than Bryan. It adopts the vocabulary used at Morrill Hall five years earlier, but with more assurance and sophistication. It is a fine example of Georgian Revival in which good proportions and simple lines dominate. Interest is added to the facade by the alternation of arched and square headed windows on the three floors and by the decorative use of Flemish bond in contrasting bricks under the eaves. It has a fine classical cornice and a flat roof. The two classical entrance porticos are located on the northern facade facing what at one time was the major quadrangle on campus. In 1983, College Hall was rehabilitated with great care for the Anthropology Department. The original double hung windows were duplicated, retaining the integrity of the exterior. In the interiors, the original oak detailing was replicated in a manner that evokes the traditional feeling. College Hall is a significant structure within the core forming the southern edge of a highly significant open space. A $3,500,000 renovation was finished in January of 1984 for the Department of Anthropology. Gift of the Class of 1905, dedicated June 9th, 1909 as the Campus Entrance Arch. Razed in 1955 when the official campus entrance was moved to its location at the south end of Stadium Way; some of the rock from the Arch was used in constructing a Stadium Way entrance sign which was designed by Philip Keene and Glenn Wegner and completed in October of 1956. A new Arch was built in 2003, at approximately 3/4 the size of the original. The new arch is not precisely in the location of the old arch, which went over Oak Street, slightly northwest of and at a 135 degree angle from the current arch. Although construction was begun in 1912 it was not ready for opening until 1913. Cost, $25,000. Architect: Rudolph Weaver. Building also refered to as President's Residence or President's House. Architect: Rudolph Weaver. This building was begun in 1914 but lack of continuing appropriations postponed its completion until 1916-1917. The hall cost $150,000. Wilson Hall is the twin of Carpenter Hall and like that building was unfinished for several years. The third floor was added in 1920. When contruction began, a June 10th, 1914 ceremomy dedicated it after James Wilson, Secretary of Agriculture from 1897 to 1913. It served as an agriculture and horticulture building. On September 18, 2009 it was rededicated as Wilson-Short Hall after James F Short Jr., of WSU's Sociology department. In the original design, Weaver proposed a glass-walled stock judging pavilion projecting from the rear of the building, but partly enclosed in the recess formed by the U-shaped plan. This was not completed. The first use of the unfinished structure in 1917 was to teach vocational skills to soldiers and for a while it served as a military barracks. However, after the war it became the headquarters for nine agriculture departments and served the entire Pacific Northwest as an agricultural information and resource center. Unlike Carpenter Hall, the grand entry to the second floor level was carried out. A flight of steps leads up to an impressive doorway with a broken pediment. This is probably the only feature on campus which could be described as Baroque. Architect: Rudolph Weaver. Initial work not completed until 1915; dedicated June 9th, 1915. Cost, $150,000. Carpenter Hall was one of seven buildings designed by the first University architect and first chair of the Architecture Department, Rudolph Weaver. It and Wilson Hall were planned as virtual twins, but because of bad cost estimate, overruns, inflation, and World War I wartime restrictions, neither was fully completed until 1926 (though both were occupied, even if unfinished, by 1915). First known as Mechanic Arts (or Mechanical Arts) Building, it was named on October 22nd, 1949 after H. V. Carpenter, the first dean of the College of Mechanic Arts and Engineering. After going virtually unchanged for decades, in 1989-1992 it underwent a dramatic internal remodel, designed by NBBJ. “Basically, the only things that were saved were the internal and external bearing walls and stairwells.” Roof removed and a lightweight steel structure was added to the roof, creating a new fifth floor for faculty offices. New entry plazas and sidewalk connections to north and south. Rededicated April 25, 1992. Planned at $7 million, with another million in overruns by early 1990. Close to $9 million by the end. It is a fine classical structure of red brick which bolsters the southwest corner of the campus core on Spokane Street. Using the first floor as a strong base and uniting the three upper floors by means of giant pilasters between the windows, Weaver has produced a bold effect. The strong terra cotta cornice caps the facade confidently. The use of ornament elsewhere is restrained. A grand entry at second floor level, as at Wilson Hall, was planned but never executed. Presumably, the steep slope to the west and its orientation away from the rest of the campus made it impractical (construction on this grand entry was actually begun in the 1920s, but after Rudolph Weaver left in 1923 his successor, Stanley Smith, nixed it and replaced it with a small lower level entry arch). In this building, the Georgian and Classic Revival vocabularies have been skillfully adapted to the needs of a large university building. During World War I, Mechanic Arts was one of several campus buildings to house soldier trainees on campus, and to serve as an informal hospital when the Spanish Flu hit campus in October 1918. Originally known as Practice Cottage. May have been known as the McKay House? Originally located where Community Hall stands, Practice Cottage was moved across the street to its final location in 1920, and was eventually renamed as the Home Management House until it became a weaving laboratory in 1968. It was razed in 1982. It was located on south side of Campus Avenue, between what is now McCroskey Hall and Honors Hall. This should not be confused with the Home Economics House and Home Economics Experimental House, both of which were located on Columbia Street. Built in late 1918 and early 1919 was a YMCA building; this was on the "alumni fields," which were tennis courts until 1918, near the book store. The two-story building was contained a 500 person auditorium, billiard room, and a "moving picture machine." Its official opening was Feb. 21, 1919, and its dedication was on March 16th, 1919. Internal pictures of this building can be found on page 7 of the April 9, 1919 Evergreen. This was later converted to a dorm in 1921 to provide quarters for 62 men, and then to a women's dorm in 1922. Known then as the Stevens Hall Annex, and later just as the Annex, it was torn down in May, 1937, just as Wilmer-Davis Hall was being completed directly behind it. Architect: Rudolph Weaver. Built as a women's dormitory; since at least 1917 women unable to get into Stevens Hall had been staying at Willard House, on Colorado Street a block outside the northeast campus gate. Cost almost $150,000. It was named for R.C. McCroskey, a prominent Garfield rancher and banker who was a member of the Board of Regents from 1897 to 1905 and 1909 to 1922. He also served in the state senate in the 1891 and 1893 sessions. It is the second oldest residence hall on campus, with only Stevens Hall, completed in 1896 and Ferry Hall completed in 1900, but razed in 1975, preceding it. Its location on the western periphery of the campus core, as a single structure, makes it one of the more physically outstanding residence halls, since it is one of the few that is not part of a complex of buildings. Like Weaver's other buildings, the design is Neo-Classical. The north-facing entry is accented with a fine central feature of stone pilasters. Elsewhere the pilasters are brick with stone capitals. The very heavy entablature below the attic story seems overscaled, particularly as it is now painted (1985). Architect: Rudolph Weaver. Community Hall, located in the Duncan Dunn and Wilmer-Davis residential complex at the northwest edge of the historic campus core, was originally built as a residence hall for women. Like the other buildings within this complex, Community continues to serve its residential purpose. It was constructed under the Self-Amortization Plan that was first developed at WSU and later became the adopted method for financing the construction of university structures throughout the nation. The Self-Amortization Plan was the brainchild of Regent McCroskey, Bursar Kruegal and President Holland. The original group of 25 stockholders consisted of university and business people from Pullman who formed the Community Building Corporation. Each stockholder held two shares of $100 each. The corporation sold bonds for the construction of Community Hall. The bonds were self-retiring from dorm rental and dining hall income. This spirit of "town and gown" cooperation was further demonstrated by the construction of Stimson Hall, Commons, Duncan Dunn and Waller under the same funding plan. This four-story building of classical proportions is sited with the main entrance facing to the south having access onto College Avenue. The building mass is symmetrically balanced around the central front portico, which is approached by a relatively long flight of stairs opening onto an entry terrace. A cupola over the entrance accents the symmetry of the structure. Facade detailing in the classical mode with brick, wood and courses of ashlar set the precedent for the later structures in the residential complex: Duncan Dunn and Wilmer-Davis. Community was renovated between 2010 and 2012, at which time connecting halls were added between the two at the east and west ends, creating a central enclosed open-air courtyard. The conjoined buildings' official reopening ceremony was held on August 23, 2012. Architect: Rudolph Weaver. Cost, $150,000. Men's dorm; initially housed 257. Stimson Hall is the oldest extant men's dormitory on campus. It was built by Community Company on the Self-Amortization Plan (see Community Hall). The building is sited on College Avenue, once surrounded by City of Pullman subdivision plats. It opened in fall of 1922 and was briefly known just as the "new dorm," before being named after Fred S. Stimson, former regent, in 1924. The courtyard fountain was built by Stimson residents, and first used there for a May 26, 1928 spring informal. This U-shaped, red brick building is a pleasing mixture of the Colonial and Renaissance Revival Styles popular in the 1920s. It has retained its architectural integrity to a marked degree. The cupola and thirteen dormers with tracery windows remain intact as do the bay windows and arched door at the entry level. Charming arched walkthroughs at the inner corners of the U provided convenient access and frame the views beyond. Classical symmetry and a sunny, south-facing orientation combine to make Stimson Hall the most inviting of the residence halls. Stimson was closed in 1983 for needed rehabilitation. Because of its location in the midst of the campus core, it was considered for conversion to office space. To date, retention of Stimson Hall as residential space continues to be upheld and working drawings for its residential rehabilitation are being prepared. Alumni have demonstrated great loyalty to Stimson. This popularity is due to a unique form of student government and the physical layout of the hall with its bed and study sites. Upperclassmen moved upstairs to coveted quiet space on the top floor. Internal renovations to Stimson were completed in spring of 1986 at a cost of $4,000,000. Architect: Stanley Smith. Another community project. Dining room for both men and women living in dormitories. Cost, $150,000. Also known as the Brick Commons (to delineate it from Stadium Commons, which existed from the 1940s to 1960s) or just the Commons. This massive three-story structure is located at the corner of Columbia and Idaho Streets at the southwest edge of the historic campus core. The relatively isolated site condition of the structure may be due, in part, to the original character of the surrounding site, which by 1929 was a subdivision plat that extended uphill towards Waller Hall. Commons was originally built as a large dining hall and apartment complex under the Self-Amortization Plan (see Community Hall). The upstairs apartments were let to citizens of the community demonstrating the cooperation of the "town and gown" which was prevalent during this period. The overall classical motif of the architectural detailing on the facade is enhanced by the palladian windows that run on the north and east elevations at the first floor level. There are two main entrances to the building to the north and to the east. Today, the large four-story building mass of Commons and its characteristic classical detailing combine to identify the southwest edge of the historic campus core. Architect: Julius A. Zittel (with Stanley Smith). On December 10th, 1926, Troy Hall was dedicated after David S. Troy, a dairyman from Port Townsend and a member of the WSU Board of Regents from 1910-1916, who later became a State Representative and a State Senator. Troy Hall was originally used as the dairy building and for many years housed the popular WSU Creamery, Ferdinand's; it also housed chemistry classes. The vertical classical detailing of the facade accentuates the prominent siting of the structure, especially when seen from Stadium Way. The structure forms an anchor to the historic core on the southeast boundary and creates a strong visual link to Wilson Hall, located uphill from Troy. The main entrance to the building faces to the south onto College Avenue, although a major pedestrian traffic flow enters the building from the north. The south entrance portico in the classical style is enframed by two elegant, five-globe light standards. Troy Hall remains an important contributing structure that marks the boundary to the historic core at this edge of campus. Troy was emptied in 2010, and remained empty thereafter. Extensively remodeled in 2015-2017 at a planned cost of $32.3 million, to be 50,000 sq ft. It was reduced to a shell, retaining only the east, south, and west exterior walls. The remodel was conducted by Lydig construction, after a Perkins & Will redesign including a 10,000 sq feet addition to the north. Sitting on Thatuna Street, northwest of the old Bookie site, this was apparently originally built as a home for the Alpha Chi Omega sorority, who moved into it for the 1925-1926 school year. Somewhere in the 1958-1960 range, the sorority built a new home, and sold this building to the Presbyterian Synod. Soon named the Koinonia House, it subsequently served as home for several religious entities, including the Common Ministry program. It was home to a number of campus activist groups, and to the Zoe Coffeehouse. The university approved the building's purchase in 2014, and then demolished it in May of 2015. Architect: Stanley Smith. First built as "New Dorm" in 1926, at cost of $150,000, also known simply as Women's Residence Hall. Originally constructed as a girls' dormitory, housed 140. In 1933, the structure was named for the first WSU alumnus (class of 1902) to serve on the Board of Regents (1917, 1923-1928), Adam Duncan Dunn. It was constructed under the Self-Amortization Plan (see Community Hall). The architectural facade detailing is in the traditional classical mode of the, WSU historic core, incorporating brick and courses of ashlar with double hung windows. The structure complements the residential complex of the community and Wilmer-Davis at the northwest edge of the campus. The main entrance to the building faces to the north with access onto Linden Avenue. The entry portico is an elegant Georgian style addition that adds great charm to the structure. The southern facade includes a solarium and a large terrace for social gatherings at the second level. Duncan Dunn serves its site well in maintaining the integrity of the architectural mass and detailing of this major residential complex within the historic campus core. Duncan Dunn was renovated between 2010 and 2012, at which time connecting halls were added between the two at the east and west ends, creating a central enclosed open-air courtyard. The conjoined buildings' official reopening ceremony was held on August 23, 2012. Two-story frame building built on Thatuna Street by M.C. Conley of Spokane at a cost of $9,000 as the Post Office (from its establishment on Sept 17, 1915 to the opening of this building in December 1926 the Campus Station Post office had been housed in Bryan Hall); Campus Station also originally housed the YMCA on the second floor. The Post Office was moved to the main floor of the newly built CUB in 1952 (later moved to the ground floor of the CUB in 1968 and finally permanently closed on May 12th, 2006). Building later known as the Human Relations Center; later housed eye research primates. Razed in early February 1964 to make room for Kimbrough Hall. Architect: Stanley Smith. Cost, $450,000. Housed Men's Physical Education and Department of Intercollegiate Athletics. Originally known simply as the Gymnasium. Addition added ca. 1997. Named on Oct. 12, 1946 for J. Fred (Doc) Bohler, the nationally known WSU Coach and Director of Athletics who devoted forty-two years to physical education and sport at WSU, Bohler gym has played a significant role in the history of Cougar sports. Housing a basketball court, swimming pool, handball courts and office, it still has an important role in WSU athletics. This massive red brick building is ornamented with terra cotta and cut stone. The renaissance revival window surrounds with alternating plain and broken pediments are surprisingly opulent. The original entrance with sculptural decoration faced west. The architect, Stanley Smith, was the second University architect. Between 1924 and 1947, he completed fourteen major buildings at WSU. Bohler was the first of the three athletics buildings he built on the north side of the campus. With Bohler, Hollingbery Fieldhouse and Smith Gym, he gave a strong definition to the edge of the campus core. An $11 million addition was added to the north of the building circa 1995-1996, designed by Sasaki Associates. Architect: Stanley Smith. Cost, $235,000. Originally known as the Home Economics Building, White Hall was renamed on October 27, 1960 for the nationally known cooperative extension leader, M[ary] Elmina White. In 2000, White Hall was remodeled at a cost of $15,300,000 for use by the Honors College to include a 117 student / 67 room dormitory area for the Honors Program Students. It was renamed Honors Hall leading into fall semester of 2001, and then on August 30th, 2016 the two names were combined to make it Elmina White Honors Hall. This impressive structure forms an important anchor at the northwest edge of the academic core. The main entrance to the building faces westerly overlooking the city of Pullman. However, today the major pedestrian flow approaches the building from the east into the back of the structure. The building mass encloses the north side of one of the university's most significant open spaces, the original walk to Thompson Hall, the Old Administration Building, from Reaney Park between the campus and downtown Pullman. The brick building mass is symmetrically balanced, making a cross formation with the central section protruding on the east/west axis. The overall style of the building is Georgian Revival, which creates an elegant architectural statement. Originally Finch Memorial Hospital. Cost, $100,000; $40,000 came from estate of John A. Finch, deceased mining man of Spokane for whom building is named, and balance from student fees. Architect: Stanley Smith. Building also known as Pullman Community Hospital and the Student Health Center. It was originally a student-only facility, until 1947 when the Pullman Community Hospital Corporation entered a partnership with the college. The PCHC and matching federal funds accounted for a $500,000 construction of a new wing, which was dedicated on Sept. 21, 1951. In the early 1980s an extensive $6,200,000 expansion and remodeling (architects: De Neff, Deeble, Barton Associates) included a new hospital addition on the north side and a new student health addition to the southwest. This was funded partially by a $3,700,000 bond issue by the Pullman Hospital District and by $926,100 from WSU, and was dedicated on May 23rd, 1982. The hospital functions moved off campus at the end of 2004; the Washington Building name appears to have been put in place in fall of 2005. A Finch Hall (a.k.a. the John A. Finch Memorial Nurses' Home) in Spokane was used as housing for women in the WSC Nursing programs there, and should not be confused with the Finch Memorial Hospital. Erected by the Associated Students at a cost of $29,185 in 1923; opened in January, 1924. Torn down in 1953, and a new Bookstore was erected on that spot. The new structure unofficially opened for use as of July 6, 1954 but officially opened on September 20, 1954; it had 22,431 sq. feet and cost $374,000. It was designed by University Architect Philip Keene with Glenn W Wegner, built by S.G. Morin & Sons of Spokane, and paid for through Bookie earnings. A 1964 three-story addition to the Bookstore added 30,300 square feet at a projected cost of $688,000; the architect for this addition was Trogden & Smith. The building was further expanded by 21,000 square feet of floor space in 1979-1980 by TSG Architects/Interiors at a cost of $2,000,000. The Bookstore (or "Bookie") moved to the renovated CUB in 2008, and this building closed at that point. 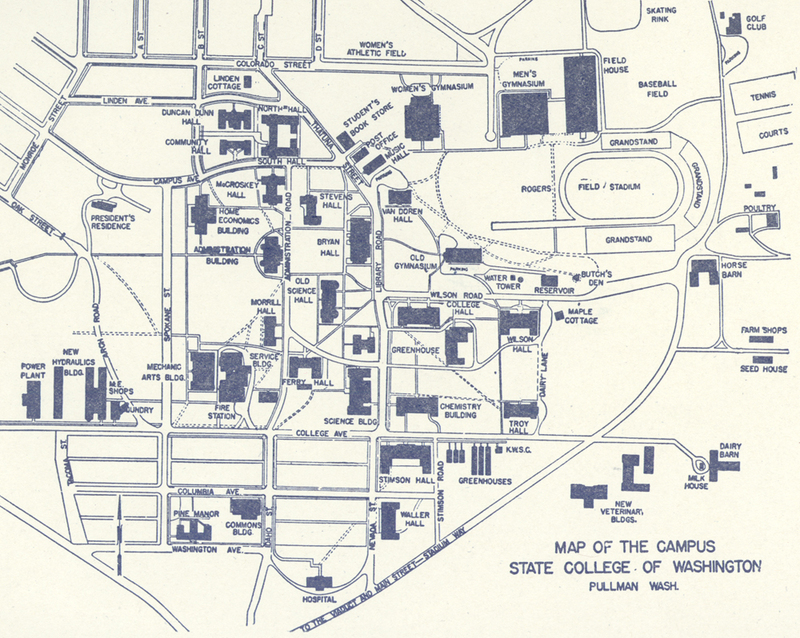 The 1954-2008 iteration of the Bookstore was occasionally listed as the Carl Pettibone Student Bookstore (after a WSU VP and longtime Bookstore Manager). The building was reopened in 2017, after heavy remodeling, as the Chinook Bulding. The Students' Book Corporation itself dates to its July 10, 1914 incorporation. From July 13, 1914 until 1923, the Bookstore was located in a small building on Campus Ave, now the current location of Wilmer Hall. Architect: Stanley Smith. Constructed by Associated Students at cost of $200,000. Annex added ca. 1980. This building was built in 1929 and known simply as the Fieldhouse (or Field House) until it was named on November 2, 1963 for the University's noted football coach from 1926-42, "Babe" Hollingbery. In 17 seasons his teams won 99 games, lost 57, and tied 19. He developed several All-Americans, took his 1930 team to the Rose Bowl and was instrumental in establishing the East-West Shrine Football Game. Hollingbery Fieldhouse was the foundation of the Physical Education, Intramural and Recreation programs at the university. It has been heavily used over the years, especially during the winter months as the primary indoor practice training facility, as a drill field for the ROTC Programs and as an intramural field. In World War II, it was used extensively as a drill field and as physical education exercise facility for the armed services. It is an imposing structure, much less ornate than the adjacent Bohler Gym, almost having the character of an industrial building. Its pitched roof echoes the form of Smith Gym and it gives a strong corner to the campus core. Architect: Stanley Smith. The much smaller Mechanical Engineering Foundry (22) was built just uphill of it in 1938, and the Mechanical Engineering Laboratory (46) followed to the south of it in 1941-1942. These three buildings, as well as the power plant downhill from them, are often confused in name, date, and identification number, so take information about each with a grain of salt. Both the Shops and the Laboratory looked very similar (two long thin buildings with a center connection). The Shops were torn down in May 1995 to make room for ETRL. The Livestock (Stock) Judging Pavilion was remodeled and repurposed in 2001 for aproximately $270,000. On April 13, 2007, it was renamed the M.E. and Audrey H. Ensminger Agricultural Pavilion after M.E. Ensminger, Animal Sciences Chair at WSU from 1941-1962, and his wife. A 1952 storage addition was removed in the 2001 renovation. Architects: Whitehouse and Price. Originally four stories at $230,000. Housed Department of Chemistry. Originally known as Chemistry Hall, or New Chemistry Hall. During graduation week of 1948 (May 29-30). this building was named for the head of the Department of Chemistry and Dean of Faculty at Washington State University. Elton Fulmer, a nationally known chemist, served the institution from 1893 until his death in 1916. He wrote the state's pure food laws. A six-story addition containing 79,103 square feet for housing additional teaching and research laboratories was begun in 1959 and completed in 1961 and cost $2,200,000. This is refered to as Fulmer Annex, and was designed by Seattle's Harmon, Pray, and Detrich. The dedication for that addition was held June 18, 1962 during a Northwest Region meeting of the American Chemical Society. In 1987 construction began on two new additions: a one-story vibration-free facility to the north (underground, with a concrete plaza above it), and a six-story synthesis building. Both were designed by Brooks Hensley Creager of Spokane. They were jointly dedicated on October 21, 1989. The building is located in the core of the campus and is a significant contribution to the natural sciences core, which include physics, geology, the biological sciences and chemistry. Pre-addition Fulmer Hall is a good representative of American architecture of the thirties. The classical language already established on the campus is the basis of its design, but the vocabulary has been reworked in a contemporary way. The entry facade to the north exhibits a pedimented central door, capitals of an original type and over the top floor windows ornamental roundels illustrating themes from chemistry. Architects: Rigg and Vantyne. Four stories for $270,000. Known as New Science until 1947, and then just as Science Hall until being renamed Abelson Hall (jointly after Philip and Neva Abelson) on Spet. 6, 2002, was built at a cost of $270,000, most of which came from State Emergency Relief and Public Words Act funds. It is a red brick background building overwhelmed by its 1984 triple-decker rooftop addition. It does continue to provide some sense of continuity to the campus core through the original buildings use of traditional WSU materials. However, this building, like some of the others of the later period, lacks the fine architectural quality established here at the turn of the century. Abelson houses the Charles R. Connor Museum, named for the 1893-1894 president of the Board of Regents, who started the museum in 1893 with two car loads of specimens from that year's Chicago Exposition. The museum was initially in fourth floor Thompson, moved to Murrow in 1990, and then to Abelson in 1935/1936. $240,000 (equipped). Power, Light and Heating Plant. PWA project. Also referred to as the Boiler Plant. Architect: Stanley Smith. Steel frame structure with face brick exterior. Matching extension to the uphill side. Sheet-steel second floor addition over the main entrance. Central elevator tower. Large smokestack to the up hill side. Architect: Stanley Smith. Cost: $175,000 (Community Project). Opened fall 1935; originally just known as New Men's Dormitory until renamed as Waller Hall at the end of 1935. Housed 300. In 1957 it was expanded by adding a fourth floor to each wing. The overpass crossing Stadium Way right below Waller was built ca. 1965 or 1967, and demolished on Dec. 23, 2012. Waller Hall was constructed as a men's residence under the Self-Amortization Plan (see Community Hall). It was named for Osmar L. Waller, former vice president of the University. Waller Hall continues to be a men's residence to this day. The U-shape building mass replicates the form of Stimson Hall, although the quality of the open space within the U-shape at Waller has been lost somewhat because of its eastern orientation which leaves the space in shade during a good portion of the day. Waller Hall provides an example of historic architecture at an important entry point into the campus. This quality could be reinforced or negated by future alterations in the traffic pattern or future building in the area. The Colonial Revival style of architecture is strongly related to Stimson Hall and echoes the use of the traditional campus materials of brick, wood and courses of ashlar. Associated Students —- $16,000. Replaced in 1971; new architect was Adkinson. The 1936 KWSU radio tower was demolished on April 15th, 1970. It had been located in (or close to) what is now the Olympia Ave. Hall parking lot. A KWSU-TV broadcasting relay station was completed on Kamiak Butte on February 1st, 1973. Architect: Stanley Smith (with John Maloney). Named for regents A.W. Davis and F.J. Wilmer. Wilmer housed 95 students, and Davis 100. Cost $350,000 (Community Project). Referred to as "New Women's Dormitory." The dining facility was extensively remodeled in 2003-2004. The Wilmer-Davis residential complex was built at the same time as "twin" residence halls for women under the Self-Amortization Plan (see Community Hall). The U-shape follows the sample of Waller Hall and Stimson, although the building mass at Wilmer-Davis is much larger. The interior open space is oriented to the south and maintains a pleasantly warm, micro-climate during the colder months of the year. The structure sits impressively on its site at the corner of Linden Avenue, Thatuna Road and Campus Avenue, anchoring the northeast and northwest sides of the women's residential complex. This cluster of buildings is tied together with the same classical and Georgian Revival architectural themes composed of brick, wood and courses of ashlar. In addition, Wilmer-Davis, by its sheer building mass and architectural detailing, reinforces McCroskey Hall, which is located to the south across Campus Avenue, and identifies an important entry point into the academic campus core. Architect: Stanley Smith. This building was most interesting for its social history. A direct result of the Depression, it was a $30,000 project of the National Youth Administration, providing vocational training for fifty high school graduates. It was used as a cooperative group home for men (housing 87) until 1963, when it became the Anthropology Research Lab (or Center for Northwest Anthropology). It was located on the northeast corner of Spokane and Washington Streets, and torn down in mid-May,1998. It is a simple framed structure of domestic scale well proportioned but of little distinction. It does not conform in its use of materials or architectural style to the architectural character of the majority of campus buildings. Its most notable feature is the central hall paneled with rich, knotty pine. Architect: Stanley Smith. This was torn down ca. 1990-1991. Architect: Stanley Smith. Cost, $400,000. Housed Women's Physical Education Department. Smith Gymnasium was the first women's physical education building, and named on October 15th, 1961 for Helen G. Smith, Chair of the Department of Physical Education for Women, 1928-61. It was previously just known as the Women's Gymnasium. Architect: Stanley Smith. The building features brick corbelling, a large stone cornice, and geometrically patterned brickwork spandrels, but it is the south facing entrance that is of particular interest. The entrance is approached over a concrete bridge and is a rare campus gesture towards Art Deco Style. The floor is flanked with pilasters; over the door is a low relief stylized sculpture of five female figures with Greek key and Deco sunrise motifs. Smith Gymnasium is one of a group of athletic buildings that define the northern boundary of the campus core. Its north elevation repeats the high gabled profile of Hollingbery Fieldhouse at the other end of the complex, strengthening the sense of edge. Architect: Henry Bertelsen (Guller & Associates). Named for John E. McCoy. Two story brick masonry structure, with steel and wood joists. Flat roof. Flush-wall brick exterior. Metal-frame windows and wood doors. Doorways accented by stone work alternated with brick in a horizontal pattern, commonly called "the stripes." Window ventilation. Originally called Veterinary Clinic, the building remains such but now has many additions to one end and the rear. Despite the many additions (including one added in 1961/1964 at a cost of $1,685,000), the original building itself is little changed. Architect: Whitehouse and Price. Three-story, reinforced concrete with face brick. Exterior design copies older masonry buildings of the Classical/Georgian design, including Wilson Hall and Fulmer Hall. Library addition ca. 1964 provided library stacks and reading room for College of Veterinary Medicine and was pre-estimated to cost $103,200. Remodeled ca. 1982 (or 1986-88) at a cost of $8,600,000 to accommodate forced air ventilation. Exterior trim in limestone featuring carved heads of domestic animals. The Stadium Way overpass between Troy and Wegner was funded in Spring 1972 and probably constructed in 1973. Architect: Archie Rigg, of Rigg and Van Tyne (with consultation from Stanley Smith). Two one-story brick masonry buildings of a long, narrow footprint. The downhill (western) piece was built first, in 1941-1942, and the central and uphill (eastern) pieces followed in 1946-1947. Both have a ninety-degree gable roof with "Georgian" false chimney endwalls. The design matches the earlier Mechanical Shops (23), adjacent uphill (demolished ca. 1996), and the later Thermal Building, adjacent to the north. West, North, and South Houses were all erected in 1946-1947 from former buildings at Farragut. South Hall sat on the south side of Farm Way (later Grimes Way), where the Bustad parking lot now sits. It was demolished in May of 1962. War Surplus dormitory that sat on the site later occupied by the French Administration Building. Originally named North House (also refered to as North Hall), then changed to Esquire House in 1952, then back to North House, and then (1960) to Sherwood House. It was occupied in fall of '63 by members of a fraternity; demolished in September, 1965. War Surplus dormitory that sat on the Stadium Way site later occupied by Fine Arts and the adjoining parking lot. Completed in October, 1946 at a cost of $30,000. Cost included site preparation and utility construction only: the Federal Public Housing Authority moved the building from Vancouver, Washington, and re-erected it on its WSU site at no cost to the college. 56,280 sq. feet. 88 single rooms, 134 double rooms. 2 head resident suites, 2 counselor quarters, 4 lounges, 4 laundries. Originally used as a women's dormitory. Name change to Pioneer Hall occurred in 1952. It was torn down in summer of 1965. Architect: Stanley Smith. Originally known as Smith Agricultural Engineering Building (or Agricultural Engineering Laboratory Building) . Named for chairman/professor of Agricultural Engineering, 1921-1949. Concrete block and woodframe structure, with brick and clapboard exterior. Two stories, with sloped roof. West-facing wall is largely glass--actually very large windows--between two massive-appearing brick faced structures. Central area designed for use as a machine shop with natural light. Originally a U-shaped building; 1967-1968 addition filled in the U and added to the south end of the building as well. That addition was by architects Evanoff & Kabush of Spokane; budgeted at $534,000. East House () Completed in September, 1947. Another former building from Farragut. East House was due east of North House, right beside it. Research building located behind Wegner Hall, between that and the Cattle Disease Building. Built ca. 1966, torn down in 2011. The University apparently reused the building number (47, which had been Pioneer House), leading to some confusion in later decades, but this does appear to have been entirely new construction. The fully equipped building was estimated at $150,000, only $45,000 of which was actual construction costs. Endoparasite is used interchangeably with Endo-parasite and Endoparasitic over the years. Later known as the Neurological Sciences Center. A one-story, temporary building of wood-frame construction. It had 29 offices, 3 classrooms, and 6 laboratories. The 20,464 square foot building was "E" shaped. Cost: $36,207. F.W.A. moved the building from Farragut, Idaho, and re-erected it just east of the L.J. Smith Agricultural Engineering Building. Psychology Building (58) Completed February, 1948. Housed staff of Psychology Department until such time as Comparative Behavior Laboratory and Todd Hall Addition were completed. Until early 1960s it also housed College of Education as "Old Education Building." Built in 1942 the structure served as a dispensary at the U.S. Navy’s Farragut Training Station at Lake Pend Oreille, near Sandpoint, Idaho. It was acquired as surplus property from the government in 1947, cut into sections and moved to Pullman and re-erected on its site on the north side of Washington Street, between Nevada and Idaho streets on the south side of the campus. It was to have been temporary, a structure to help the university cope with the post-war bulge of GI’s returning to school. It was demolished in August, 1974. Dining Hall, located east of Stadium Way across from West Hall. Building moved here from Vancouver, WA. Closed in 1961 with the completion of the Hall Rotunda. It was eventually torn down, and the rubble from it was burned on April 4th, 1964. Architect: John Maloney. Formally dedicated on May 14, 1949. Cost $1.92 million. As of 1963, this was the largest classroom building on campus. Also headquarters for College of Economics and Business and departments of history, political science, sociology and anthropology. Building named prior to construction for former Dean of College of Sciences and Arts, C.C. Todd. Four story, reinforced concrete classroom building with flush-wall brick exterior, relieved by large limestone panels, some of which have been removed and replaced by brick. Limestone trim also used at cornices and around some entryways and windows. The original interior of Todd Hall was one of very long central hallways with classrooms on one side and faculty offices along the other side, brought out into very public position. Much remodeled ca. 1970. Largely obscured from public view by the $5,600,000 33,770 sq. foot Todd Hall addition of June, 1989 - December, 1990, which combines design features of Todd Hall with those of the adjoining Wilson Hall and College Hall. Architect for the addition was David Hall of the Henry Klein Partnership, Architects, of Mount Vernon, WA; contractor was CD Contractors, Inc., of Helena, MT. Opening ceremonies were held Dec. 14, 1990. The remodeled version is more one in which the hallways terminate into office suites part way along the length of the building. At the mid-point in the length of the building, the central hallway is interrupted by a brick feature composed of walls, doors, stairs, mechanical system elements and so on. The foyer of the original main entry has been retained. It features pink wall tile and aluminum gratework over cast iron radiators. The pink wall tile is also found in the restrooms. A limestone relief statue "Prometheus" (designed by architect John Maloney) that originally was located over the main door remains in position inside the building over the entry to the original main foyer. Todd Hall's Cougar Head door handles also appear to have been designed by Maloney, first appearing on Maloney's original (11-18-1946) building blueprints (sheet A13). Architect: Whitehouse and Price. Named in honor of Mr. Homer Dana, former director of the Engineering Experiment Station. Headquarters for College of Engineering, Division of Industrial Research and Physics Department. Contains many laboratories where research for Northwest Industry is conducted. Also known as Technology Building, or the Institute of Technology Building. Naming ceremony: Sept 30, 1960. Long-narrow building, two stories with high attic area now serving as third story. Reinforced concrete with face brick. Constructed with potential for forced air ventilation, but not installed. Steam radiator heating. Flush-wall brick exterior, with large "industrial" metal-framed windows. Distinctive entries with relief craved aluminum featuring engineering themes. These panels are set in an area of limestone panels of vertically oriented fluting. The entryways are sometimes floodlighted for effect. The interior is characterized by green tile walls and rough-finish plaster ceilings. Since largely unmodified, except for the third floor attic and the union where it adjoins later construction at the north end. Room air conditioners protrude from many windows. Originally the Mining Experiment Station and Wood Products Laboratory. Architect: Whitehouse and Price. Large, barnlike building with gable roof and brick ends featuring false chimneys. Steel frame, with brick walls. One-story concrete frame building with brick veneer face; partial second floor and mezzanine. Contained office, pilot plant, ore grinding and smelting rooms. Built as part of the Dana Hall project for laboratory space to be used by engineering departments and the Physics department. The building is a larger version of other engineering lab buildings. The addition on the west was approved by the Board of Regents in Sept. 1958. The athletic field in that spot dates to March 1892, when the state college defeated Pullman's military college there, 26-0 in baseball. The first bleachers were erected in 1900, on the southeast corner. A south grandstand was built in 1921, and a north grandstand in 1926. The south stands were reworked in 1936. The south stands were severely damaged by arson on April 4th, 1970. Remodels of rest of stadium occurred in 1972 (South Stands, by NBBJ), 1975 (North Stands, by NBBJ, cost $1,490,000), 1990, 2000, 2007, 2012 (southside luxury boxes and pressbox). Formerly known as Rogers Field (1902-1972), and as Soldiers Field before that. This listing of constructions and remodels is likely far from complete. Holland Library was built between 1948 (first groundbreaking was September 24, 1947) and 1950 (the dedication ceremeony occurred on May 28th, 1950 at 10:15 AM), and was named after the former Washington State College President Ernest O. Holland. Designed by John Maloney, Holland Library was one of the first buildings to be constructed with modern functional architecture. It cost $2,600,000 and was designed to house 1,500,000 volumes and seat 2,200 students at one time. The Library's most distinctive detail is a 30-foot high statue on the West side, near the original main entrance. This statue was designed by Seattle artist Dudley Pratt, and officially named "The Reader." It was carved in Bedford, Indiana, the source of the limestone used on this and several other campus buildings, especially Todd Hall and Smith Gym. The statue has long been known informally as "Nature Boy." The name may be recognized by popular music fans as a famous song recorded by Nat King Cole in 1948. Officially dismantled in July, 1987, this had been vacant since the death of Butch VI in 1978. This was located just northeast of Martin Stadium. An earlier cage had sat on the hill above and to the south of the west end of Rogers Field. That cage was replaced by the Stadium Way cage during the summer of 1950. Apparently (?) an even earlier cage had sat approximately where Todd Hall and its 1990 addition connect. Wilson Compton Union Building. Architect: John W. Maloney (1957 and 1967-1968 remodels also by Maloney). Remodeled again in 2006-2008. Opened September 15th, 1952, and officially dedicated on October 25th of that year. Originally three story, now four story, reinforced concrete structure. The building is set on the edge of a cliff-like slope, and the downhill side overhangs this slope in many places. Much changed from remodeling in 1957, and major addition and remodel in 1967-68. Flush-wall one-color brick exterior, with no corner or cornice trim. Sandstone around principal entryways. Some panels of painted concrete. Strip windows in places. The front of the building has mainly glass walls on the lower floor, above which a glass and steel-panel wall constitutes the exterior of the second floor. The lower glass is from the remodeling of 1957. At the east end of the building, a large box-like structure without windows houses a theater that was added in the remodeling of 1967. The exterior of this box is largely painted concrete of a terra cotta color. Architect: Paul Thiry. Three buildings, two dormitories (Barnard, McGregor) and one cafeteria (Stearns). Housed 396 students. Painted concrete exterior with semi-strip windows. Built into the side of a hill, the dormitories are long buildings of four stories of residence space set on "piers" one story above ground. The two building met at the corner to make a V-pattern at an angle of about 100 degrees. In the open end of the angle, open decks spanned the two buildings. In the inner side of the angle, a Japanese rock garden, since overgrown, was placed on a slope through with stairs and walkway lead uphill to the cafeteria building. Architect: Glenn Wegner. Laminated wood beam structure supporting a plywood dome. A history of the origins of the Jewett Observatory (and the Dana/Todd planetarium) can be found in the Mathematics Notes from Washington State University Vol. 23 #3 (August 1980), available in MASC (WSU 108) or in the Owen Library (call number QA1.M382x). Initially a pair of dormitories, Kruegel and McAllister Halls, with a connecting lounge space. Named for Dean Charles E. McAllister (former President of the Board of Regents) and William C. Kruegel (Bursar of the College, instrumental in financing the Pullman Community Building Company, a nonprofit corporation set up to build WSC residence halls). Dormitories housed 207 students each in about 47,000 sq. feet each. Jointly dedicated with Neill Hall on April 28, 1957. Architects: Victor Jones & Lloyd Lovegren. McAllister was demolished in 2015, but Kruegel and the connecting lounge were kept. Named for Judge Thomas Neill, one of the leaders most instrumental in bringing the college to Pullman. Dormitory housed 207 students; 45,786 sq. feet. Neill, Kruegel, and McAllister cost a combined $2,260,000. Jointly dedicated with Kruegel-McAllister Halls on April 28, 1957. Architects: Victor Jones & Lloyd Lovegren. A $4,000,000 renovation subsequently changed this from a residence hall to the Math building. It was rededicated to that purpose on April 13, 1991. Ca. 1960s, was described as “most important non-Federal laboratory of its kind In West. Has contributed greatly to hydroelectric development through studies of comprehensive models of dams about to be built.” Named in 1957 for former Director (1949-1957) of Division of Industrial Research, Raymond L. Albrook. Cost $250,000. Main building erected 1955, an east wing added in 1956. Two small 1962 additions: $50,000 in new office space (1500 sq feet), and a $75,000 annex (4600 sq feet). 1967 addition housed State of Washington Water Research Center (to cost $211,000, to be 5600 sq. feet). Housed 142 students; 36,406 sq. feet. Architect: Paul Thiry. Scott and Coman Halls opened for Fall of 1958, and were jointly dedicated on Nov. 16, 1958. Housed 142 students; 34,830 sq. feet. Coman and Scott jointly cost a total of $1,515,000. Architect: Paul Thiry. Cost $100,000, plus $68,000 addition in 1958. 24,706 sq. feet. "Old Seed House" had been located on the south side of Farm [Grimes] Way, due south of where French Ad is now (between North and South Houses). 99 units at a cost of $1,000,000. Architects were Walker, McGough, & Trogden. Originally titled the Nuclear Reactor Building. Cost $210,000 ($180,000 reactor, $30,000 fuel). Ca. 1963: housed the institution's one-million watt research nuclear reactor. The reactor was a "swimming pool" type, powered by 3,580 grams of highly enriched Uranium 235. Building contained laboratories for research, and also a smaller sub-critical teaching reactor. Architect: Phllip Keene. Named for Edward C. Johnson, who was Dean of the College of Agriculture from 1919-1949, and Director of the Agricultural Experiment Stations from 1919 to 1946. It was built to house Plant Sciences: Agronomy (Crop and Soil Sciences), Entomology, Forestry and Range Management, Horticulture, and Plant Pathology. Construction began in 1958, but first that site's existing Poultry Hill had to be reduced 65 feet in elevation, requiring the removal of 300,000 yards of soil. The building was occupied in January, 1961, and was dedicated on July 12th of that year. A plaque in Johnson notes it as having been dedicated on May 9, 1959; that may(?) have been the groundbreaking ceremony. It grossed 181,727 square feet, was four stories plus a "penthouse," and cost $4,115,390.71. $1.9 million of that came from the state legislature, with the rest from the 1958 voter-approved state Referendum Bill No. 10. Architect: Jones, Lovegren, & Associates. Note: Johnson Hall is commonly confused with Johnson Tower, but these are two different and separate buildings. In 1967, an additional 8,000 square feet was added to the east end of the Johnson Hall Annex at a budgeted cost of $315,000; this initially served as a Computing Center Addition. Sloan Hall (78) Built in 1961. Opened in 1962 (dedicated April 27th of that year), building contains 84,697 square feet and cost $1,800,000. Housed several Engineering Departments and Department of Mathematics. Named after former Dean of College of Engineering, Royal D. Sloan. Architect: Culler & Associates. Included planetarium since construction. Housed 324 students each; including furniture Gannon, Goldsworthy, and the Hall Rotunda had a joint cost of $3,160,000. Gannon, Goldsworthy, and the Hall Rotunda were a joint project by architect firm Lee, Pearson, and Richards of Tacoma. Gannon and Goldsworthy opened in fall of 1961; due to construction delays, the Hall Rotunda was not opened until Thanksgiving break of that year. The Stadium Way overpass between Gannon and Neill was built ca. 1967. Gannon, Goldsworthy, and the Hall Rotunda were a joint project by architect firm Lee, Pearson, and Richards of Tacoma. The Hall Rotunda first opened on the morning of November 21, 1961. Named for Stanton J Hall. Once nicknamed the "Roto" by students. Originally a women's dormitory complex, all named for former Regents. Opened in 1962, and dedicated on Nov. 18th of that year. Each housed 307 students. Complex cost $3,300,000. Architect: Walker, McGough, Trogden. On Dec 18th, 1979, student John Stickney blew himself up in 5th floor Perham Hall room after failing to reconcile with his ex-girlfriend. Damage to the building was on the order of $100,000 to $150,000. Architect: Decker & Christenson. At opening, this, and Science Hall, next door, housed Departments of Bacteriology and Public Health, Botany, and Zoology, and the Electron Microscope Laboratory. Heald Hall contained 82,223 square feet of space, laboratories for both research and teaching, offices, animal rooms, growth chambers, and other special rooms. Cost $1,750,000. The connecting walkways to Abelson were parr of its original construction. Named in honor of former faculty member and first chairman of Plant Pathology, Dr. Frederick DeForest Heald. Dedicated May 22, 1962. Architects: Lee, Pearson, and Richards. Was occupied in 1963 by male students, while workmen were still completing the upper (lounge) floor and outside of building. Dedication occured Dec. 8, 1963. Built at a cost of $2,152,000 to house 520 men. The campus housing office also was located on the first floor ca. 1963. Students living in the building when it was built ate in the Stanton J. Hall Rotunda, downhill toward the campus. Named in honor of Alan Rogers, former regent. This housed the campus police and fire departments (it was commonly referred to as the Fire Station), and was located on a high spot on the campus, so vehicles could go downhill to other buildings. Telephone switchboard was also located in building. It had 16,319 square feet and cost $265,000. Architects: Doudna, Williams, & Phipps. Architect: Wulff. Total cost of building pre-estimated at $948,000. Named for former Regent James McCluskey of Spokane. An annex was added in 2002. Cleveland Hall (86) Built 1962-1963, '67-'68. Built as new home of the College of Education. The building cost $1,535,486 and contained 62,804 square feet. It had specialized laboratories, rather than standardized classrooms, plus provision for all contemporary teaching media - TV, visual aids, etc. Could handle conferences of up to 300 people. Designed by Ralph Burkhard (Burkhard & Associates), Seattle. Completed in fall of 1963 and dedicated May 17, 1964 in honor of first Dean of College of Education, Dr. Alfred A. Cleveland. A $600,000 third-story addition was part of the original plan, but not constructed until 1967-1968. Architects: McClure & Adkinson. Opened in 1963 for 100 families. Named for Kamiakin, last important chief of Yakima Indian tribe. There are 50 two-bedroom and 50 one-bedroom apartments. This small structure was used by College of Veterinary Medicine. Pre-estimated to cost $15,000. This was the second of the 12-story dormitories at WSU. Essentially it was a twin to Rogers Hall and was built to house 520 students. Costs were pre-estimated at $2,511,000; construction began in May 1963 and it was opened in time for students to move in for fall term of 1964. Named in honor of former regent, Mr. Charles W. Orton of Sumner, and officially dedicated, jointly with the dining hall, on October 18, 1964. Architect: Lee, Pearson, & Richards. Rogers-Orton Dining Hall was built in 1964. This $1,181,276 building is used to feed students living in the two 12-story dormitories. It contained 41,147 square feet. It opened for fall term of 1964 and was officially dedicated, jointly with the Orton Hall, on October 18th of that year (Rogers Hall was finished one year earlier). Architect: Kenneth Brooks. It apparently closed somewhere between 1983 and 1987. The current Children’s Center was appropriated for in 1991, and was occupied in January 1994 in the remodeled Rogers-Orton Dining Center. Plans called for a 21,000 sq. ft. building, but it ended up only 15,000 sq. ft. In 1999, the state allotted $3 million to completely remodel the Olympia Avenue Children’s Center and combine all campus children’s facilities. In 2010, a $2 million grant added 2500 feet (2 classrooms) to the south end of the center. The WSU Child Development Center itself was in White Hall (the White Hall Preschool) from at least the 1930s until 2000 (in the first floor Fireplace Room). At that point it was moved out and to a temporary home in the Nez Perce Village Apartment Complex, and then to its current home in 2001. It’s unclear, without further research, when it actually started; it is certainly present in 1930, mnot documented as present in 1934-1938, and back from 1939 onwards. Opened in 1964. Architects: Evanoff & Kabush, of Yakima. Initially projected at $604,001, this 35,990 square-foot building brought the official publications functions on campus under one roof, vacating the bottom floor of College Hall for academic use. Also provided storage and distribution space for Agricultural Extension Service publications. This latter function had occupied a quonset on site of the Todd Hall addition. An internal "light court" was roofed over and converted to workspace circa 1970-1971 or so. Named on March 28, 1979 for Caroline M. Cooper, former Head of Duplicating and Mailing at WSU. Architects: Culler, Gale, & Martell. 49,236 square feet of space used for food storage and food handling by Housing and Food Service. Pre-estimated to cost $849,000. Architect: Edwin W. Moland & Associates. Designed to be used for research and teaching by Department of Psychology. Building planned to contain 35,990 square feet and cost $223,000. Research by psychologists using both primates and ungulates to be carried on here. Known as Primate Research Center or Comparative Behavior Laboratory. Some of the primate work had been carried on during prior years in Old Post Office. The Center ceased operating as a primate research facility in summer of 1989, with the remaining monkeys being moved elsewhere on campus. Today the building is used by EHS, who moved into the building in fall of 1986, and for bear research, which began there in spring of 1987. $55,000 replacement for garage which had been destroyed by fire in spring of 1963. Architect: Decker. Projected construction cost of $966,500. Architect: Maloney & Associates. First opened for Fall 1966 school term at a cost of $1,993,000. Building dedicated on March 30, 1967 for Claudius O. Johnson, political science professor at WSU from 1928-1960. Sometimes confused with Johnson Hall. Eight-story office tower plus three stories of laboratories. Initially housed Anthropology, Philosophy, Psychology, and Political Science, plus members of seven other departments. Named for academic vice president Dr. S. Town Stephenson. Architect: Walker McGough. Stephenson North, Stephenson South, and Stephenson Dining Hall were completed in 1966; Stephenson East in 1969. Architect: Kirk & Associates. The building was completed in late 1967 and dedicated on April 27, 1968, in honor of former University President C. Clement French. The connecting Stadium Way overpass was constructed in 1967 as well. Architect: Paddock & Hollingberry (of Yakima). Cost: $3,263,503 Officially occupied Feb. 9, 1970. Co-education gym constructed as a multi-purpose recreational center; notable for an 8-lane L-shaped swimming pool with a diving tank. Architect: Naramore & Bain (NBBJ). Designed as three-story garage with three or four floors above it; that was Phase I and Phase II called for a similar garage/classrooms addition attached to the south side of it (apparently never built). Occupied in December/January of 1970/1971. Built on a bowl, the upper portions were in-part intended to extend the central campus further to the east. In 1988, a $2 million renovation of the non-parking floors rectified ventilation issues. George Laisner Sculpture Plaza dedicated in 1980; the first art there was a Balasz work placed in 1979. Prior to that the space was a service entry and loading dock. Architect: Lovegren & Associates. The four story building was budgeted at $4.2 million. It was completed in June, 1971, and formally dedicated on September 8, 1972 in memory of Asa V. Clark, a longtime Whitman county resident who was captain of the 1915 WSC football team which played in the Rose Bowl game, and who served in the State House of Representatives for 15 years. Architect: Lovegren, etc. Originally known as Agricultural Science Phase II, it was dedicated October 25th, 1985 after James H Hulbert, former WSU Regent and prominent Skagit County famer. The Spillman Memorial Stone located just west of Hulbert was dedicated on June 1, 1940, to mark the ash remains of Professor William J Spillman. Moved off campus to the WSU Agronomy Farm in 1960 when Johnson Hall was built, it was moved to its current location in Spring, 2006 and rededicated on October 21st, 2006. The current location is within 100 feet of the original placement. Architect: Fred Bassetti (with Jim Hamilton). Dedicated May 18, 1973 in honor of former English professor Emmett Langdon Avery. The building's Murray W. Bundy faculty/student library room was dedicated on November 13th, 1973. Architect: Walker, McGough, & Foltz. East court (112 living units) completed in 1971(? ); North and South buildings (188 single occupancy living units) in 1972. The architect contracts pre-estimated $2.7 million in costs. Originally officially known as the Graduate Residence Center, and informally as various derivatives of that. Dedicated after Robert B and Margaret L McEachern on Sept. 29. 1989; Robert was a regent and the pair were alumni and long-time benefactors. Architect: Fred Bassetti. Dedicated on November 3rd, 1973, this was built to house the campus Speech/Theatre facilities. It was named for Maynard Lee Daggy, who headed WSU's speech department from its inception in 1923 until 1946. Designed to cost $3,365,000, but ended up in the $4,000,000 range. Architect: Graham & Co. Beasley's basketball court was dedicated after former basketball coach Jack Friel on December 3, 1977. The overpass connecting Beasley across Stadium Way was funded in Spring 1972 and probably completed in 1973 as well. Architect: Naramore, Bain, Brady and Johanson (NBBJ). Cost: $8,800,000. Completed in January, 1974. 16 floors (14 above-ground), 93,500 sq. feet; the roof is 178 feet above ground and 2720 feet in elevation; the highest point in Pullman. Originally housed Physics and Geology departments. The Butler Auditorium (room 16) holds the Struppler Theater Organ, a remnant of the silent movie days in downtown Pullman. Officially named on August 26,1994 for WSU Regent Kate B. Webster. Architect: Decker Architects (Kolb and Stanfield). The building was dedicated on April 26th, 1979, and was named after Herbert L. Eastlick, Chairman of the Zoology department. At a cost of $10,075,600, it provided improved space and facilities for several areas which had outgrown nearby Science Hall, including zoology, bacteriology and public health and botany. Dedicated on October 20th, 1978. Architects: Maloney, Harrington, Freesz, Lund. Bustad cost $12,500,000, with near $5,000,000 of that coming from the Department of Health. Initially known simply as the Veterinary Science Building, it was named after Veterinary Dean Emeritus Leo Bustad in February of 1985. Architect: Harris, Reed, & Litzenberger. Opened on February 28, 1977 and dedicated on March 29, 1979. Named after WSU regent Frances Penrose Owen. The building cost $6,300,000. Connecting overpass to Abelson (Science) Hall built at time of construction. Architect: Trogden. etc. Construction began in July 1977 and finished in late 1979. Commonly known as I.T. Building. Originally built as the Martin Stadium Academic Center and the Computer Science - Mathematics Building, it became the I.T. Building in 1993, after the Computer Science program was moved out. The original Bailey Field was built in the 1930s on the site of what is now Mooberry Track. It was named Bailey Field on May 13, 1950. It was later moved/remodeled/rebuilt across the street to its North Fairway Road location, taking the name with it, and the baseball Press Box and Baseball Services Building were built as part of that project. The first game in the new location was April 5, 1980. It was rededicated Bailey-Brayton Field on January 22, 2000. The two namesources are Cougar baseball head coaches Buck Bailey (coached 1927-1961, excepting during WWII when there was no team) and Chuck "Bobo" Brayton (coached 1962-1994). In 1979, when Seattle's Sick's Stadium (home of MLB's short-lived Seattle Pilots and the much longer-lived AAA Seattle Rainiers) was torn down, Brayton scavenged bleachers, screens, outfield fiencing, and the foul poles for the soon-to-be-built North Fairway Road park. The bleachers and screens were discarded when permanent grandstands were built, the fencing slowly replaced, and finally the foul poles were discarded in 2014, so apparently no discernible traces of Sick's Stadium remain here. Groundbreaking was July 19, 1984. Officially opened November 7, 1986. Architects: Cummings Schlatter Associates and Loschky Marquardt & Nesholm (of Kirkland-Seattle). Cost $14,000,000. Spokane Street overpass built 1987. Dedicated March 31st, 1989. Built at a cost of $3,500,500 from the restored/converted Animal Science Beef (also known as Beef Cattle) Barn, which was built in 1925. It was named for Jack and Ann Lewis, who pledged $1,000,000 towards the facility in 1984. Redesign architects: Steve McNutt, Bob Grossman. A very similar but not quite identical barn had originally been constructed on this location in 1922, but burned in September, 1924. The two versions can be photographically told apart by looking at the rooftop ventilation - the '22-'24 version has square ventilation with angular tops, while the '25- version had circular topped ventilators. Another campus barn, the Farm Barn, also looked quite similar, but that barn was very dark, while both Beef Cattle Barn iterations are light in color. Opened in 1989 and dedicated on October 31st, 1992. It was built as Phase I of a two-part project. To clarify a confusing project: Phase I is FSHN as we know it today, minus the telecommunications classroom. Phase II refers to the Food Quality Building just below, plus the telecommunications classroom. The name FSHN continued to be applied jointly to both FSHN and FQB for some time, even after the latter was called the Food Quality Building. The architect (for both) was Northwest Architectural Company. Both FSHN and FQB combined to cost $27,600,000, which included $12,600,000 in federal funds. Finished in 1992; jointly dedicated with FSHN proper on October 31st, 1992. Originally known as FSHN Phase II, but was called Food Quality Building by June of 1992. The architect was Northwest Architectural Company. Ferdinand's grand opening in their new location was held September 4th, 1992; it was previously in Troy Hall dating to its opening in September, 1948 (it had been named Ferdinand's one year later). Ferdinands occupies the lower level (plus the far eastern end of the upper level, which was added to the building in 2017). The upper level is occupied by the USDA-ARS Western Wheat Quality Laboratory. Cost: $36,000,000. The design architects were the Zimmer Gunsul Frasca Partership of Portland and Seattle, working with Spokane's ALSC Architects. Dedicated on August 25th, 1994, and named after former president Glenn Terrell in May, 2006. Previously known as New Library or Holland Addition. The Glenn Terrell Friendship Mall, in front of the library, was dedicated after Terrell on October 7th, 1995. Built at a cost of $16,000,000, it was named after June and Phil Lighty, who provided student scholarships. It housed the admissions office, Financial Aid office, Student Accounts/Loans, Multicultural Student Services, Counseling Services, and Career Services. Dedicated October 19, 1996. Designed by MBT Associates (San Francisco). 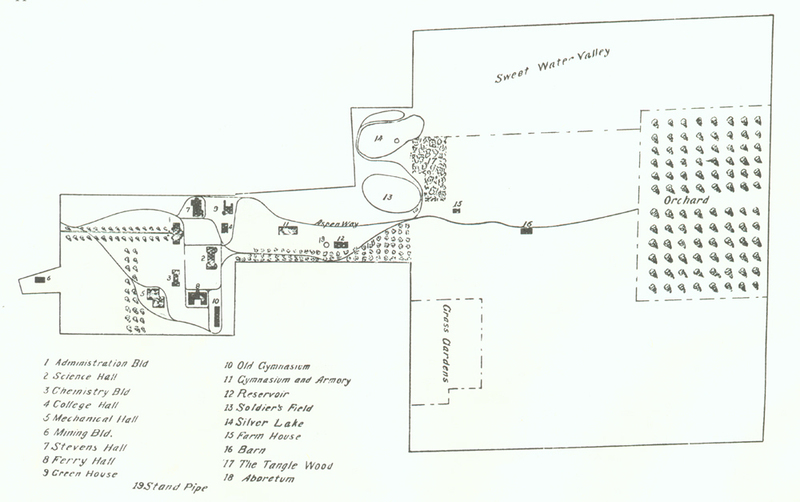 Landscape architect was Hough Beck & Baird (Seattle). Originally budgeted at $6.5 million. Connected by bridge to Clark Hall and the Experimental Animal Laboratory. Cost $8,000,000; designed by Tan Heyamoto Architects of Spokane. Open house held October 25, 1997. Architect: Callison Partnership of Seattle. Opened April 3, 1998. Funded by U.S. Department of Energy and Washington State, this building cost $27,000,000. 100,000 sq. ft. Built on former sites of Mechanical Engineering Shops and the Foundry. This opened September 3, 1996, at a cost of $38,000,000. Public open house tours followed on Sept. 26. Architect DeNeff, Deeble, Barton Associates of Spokane. Bustad and the Veterinary Teaching Hospital are connected by ABDF, the Animal Disease Biotechnology Facility, funded and started after the Vet Hospital but completed within the same year. Architect: Yost Grube Hall Architects, of Portland, OR.. A multi-use student recreation building; this was budgeted at $39,000,000 and paid for through self-imposed (by a student body vote, in 1996 or 1997) student fees. The groundbreaking ceremony was Sept. 3, 1998. It was opened January 16, 2001 and was dedicated on February 22 of that year. Architect: Yost Grube Hall Architects. Dedicated on October 23, 2001, the CUE was named after former WSU president Samuel H. Smith. It was budgeted at $40,608,300. Architect: ALSC Architects, P.S. (Spokane). An inflated structure created to provide practice space for campus varsity sports. This cost $6,700,000 for 87,000 sq ft. Construction began fall 2001 and completed fall 2002. It was intended as a permanent $13.7 million facility, but insuffucuent funds were raised leading to this temproary structure. Architect: Miller/Hull Partnership (Seattle). 33,300 gross sq. feet, built at a cost of $10,274,000. 17 laboratories, with a maximum occupancy of 50. Groundbreaking was September 22, 2001; it opened in Spring of 2003 and the dedicatory ceremony was held on August 27, 2003. Originally known as the Communication Addition or Communication Annex. Groundbreaking occurred on May 23, 2002. On September 14, 2013 this was named after WSU alumnus and KOMO news anchor Kathi Goertzen. Included 175-seat classroom, a broadcast studio and control booth, a TV and audio editing studio, two computer labs, conference rooms, seminars and faculty offices. Designed at 26,000 sq. ft, and intended to cost $8 million (actual cost was 12.6 million). It was opened for classes in January, 2004. Occasionally called the Murrow Addition before and during construction, not to be confused with what’s now Jackson Hall. Designed by Hacker and Associates; intended to cost $12.7 million. Construction started in 2004; the grand opening occurred on Oct. 15, 2005. This building was occupied in July, 2005, and the grand opening occurred on October 14, 2005. It was named for wheat researcher Orville A. Vogel on September 4, 2007. It cost $39,000,000 and the architect was the Zimmer-Gunsul-Franca Partnership, of Seattle. It had 93,700 gross sq. ft., and 46,200 net assignable sq. ft. Completed in May, 2009; officially dedicated on October 10, 2009. The building cost $72,700,000, and at completion is a four-story structure with 128,000 sq. feet of laboratory and administrative space for the School of Molecular Biosciences and the Center for Reproductive Biology. Opened to students in Fall, 2009; officially dedicated on November 19, 2009. Named for the street it is located on. Officially dedicated on September 8, 2012. Construction costs on the 62,000-square-foot research building were projected at $35 million. Named for Paul Allen, who donated $26 million to the university in December, 2010, much of which went towards construction costs for this building. Officially dedicated on May 2, 2013. Groundbreaking ceremony was on Oct. 8, 2010, though actual work began in July that year. Architect: SRG Partnership, Inc. Total project budget was $96,030,000. Opened fall of 2013; officially dedicated on Sept. 5, 2013. Architects: NAC/Architecture. Total project costs budgeted at $32,600,000; construction costs were planned at $25,000,000. Opened and dedicated on October 12th, 2013. Designed by Olson Kundig Architects (design lead: Alan Maskin). The total cost of the project is about $2.2 million. The Duane Brelsford family gave $1,000,000 to the project, which was in turn named after them. Brelsford is a Pullman-based real estate developer. The building is located at the northeast corner of NE Main and Spring streets, effectively in downtown Pullman. Previously the WSU Visitor Center had been located in the Cougar Depot (originally built as a Union Pacific Railroad Depot in 1939, remodeled as a Washington Mutual Savings Bank in 1973, gifted to WSU in 1988, sold by WSU in 2012) at the corner of NW State St. and Davis Way. Official groundbreaking occurred March 5, 2014. Expected to be completed in October 2015 at a cost of $55 million. 96,000 square foot building, designed by LMN Architects. Known during planning as the Clean Technology Laboratory Building; the PACCAR name was announced in April 2014, after the PACCAR Inc. company, who gave a substantial amount of money to the project. WSU's first corporation-named building. Dedicated September 26, 2016. Police services moved out of the Public Safety Building in 2016, allowing that building to be repurposed and remodeled as an art museum. Designed by Design West Architects. Opened Fall 2017. Known as the Digital Classroom Building during construction and planning. Four-story, 83,295 square foot building, to cost $55 million. Design: ZGF Architects. Opened Fall 2017. Named after Elson S. Floyd, WSU President from 2007 to 2015. Designed by GGLO. $12 million; 16,000 sq. feet. Campus architecture before ca. 1905 largely follows common designs used in 19th Century civic buildings. These early buildings were chiefly of brick masonry construction, with designs that reflect their purposes as classroom and laboratory buildings. Murrow East is an example of one such structure. Originally it featured a large roof that expedited the capture of breezes to create updrafts in the chimneys. It was clearly a building for scientific laboratories. Most buildings that date from ca. 1905 to 1940 reflect the various "revivalist" styles of architecture, chiefly Classical and Georgian. Some, such as Bryan Hall, are highly eclectic and combine several of the styles. These buildings had a variety of uses - again many included labs - and were build employing several structural methods, including masonry, steel frame, and reinforced concrete. Many are the designs of two WSU Professors of Architecture, Rudolf Weaver and Stanley Smith. The latest building of a revivalist style was Wegner Hall, with a design that basically follows Wilson Hall; it was built in 1941-43. Next to it stands McCoy Hall, built at the same time, but of a "modern" design. All buildings that are newer than these two follow some form of modern, functional lines, beginning with Dana Hall in 1947. Almost all these buildings are fully-stressed reinforced concrete structures, with face brick exteriors, or at least brick panels. Exceptions to the use of brick are several dormitories of painted concrete, the College of Agriculture building group, and three buildings along College Street that have exteriors of off-white crushed rock cast panels. This page was initially primarily built from two separate unpublished building histories dating from 1963 and from the late 1930s; these and other sources were compiled and updated in 2008 by Mark O'English. Numerous other resources, most of which are listed below, have been consulted or incorporated as well. Further images of many of these buildings can be found in MASC's Pullman and the Palouse Digital Images Collection and a few further images may be found by searching the entirety of MASC's digital collections. The information on this page, additional information, and images from MASC are now being compiled in a more graphically friendly interface at the WSU Historical Preservation Committee's WSU Buildings and Landscapes site. 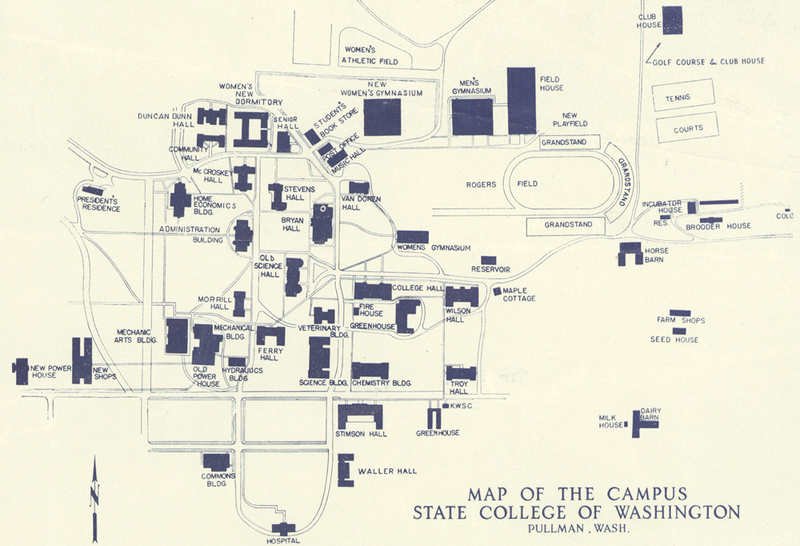 The annual Catalogue of the State College of Washington (WSU 4); these include brief descriptions of each year's buildings up through the 1930 volume. 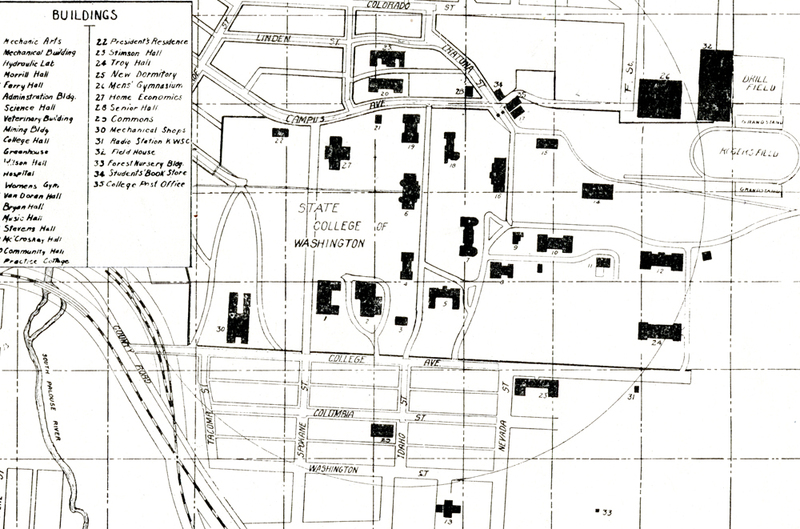 Cage 451: Washington State University : campus development from 1906 through 1915, an interim report by Donald Cecil. Numerous other MASC collections, from Presidential papers to WSU Publications, may be of use; search the MASC site to find these. 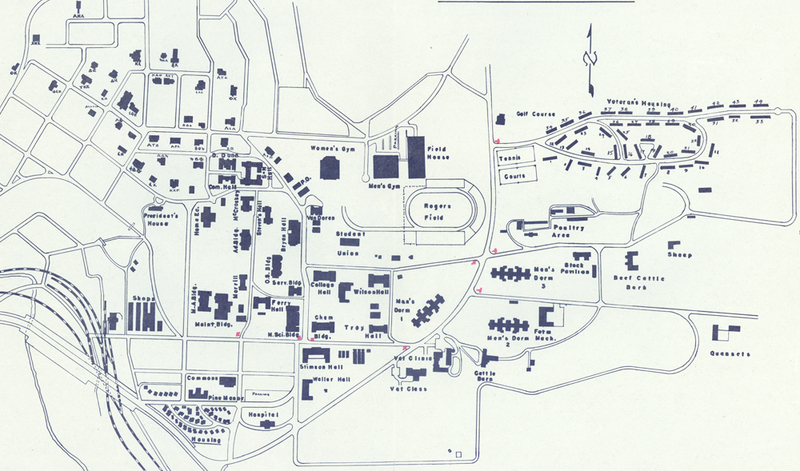 The February 12th, 1985 Historic resource survey and analysis, the report of the Task Force for Historic Preservation on the historic core of the Washington State University campus. For several buildings, much of this document's text has been incorporated into this webpage. 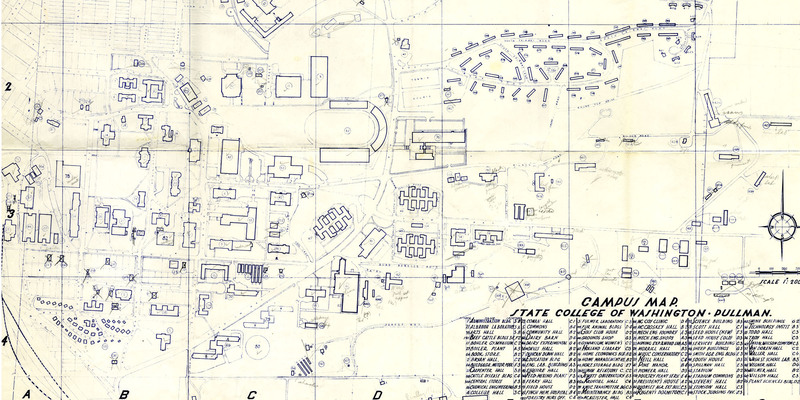 Administrators, Architects, and Campus Development: Washington State University, 1890-1905, J. Meredith Neil's article published in the May 1970 "Journal of the Society of Architectural Historians." 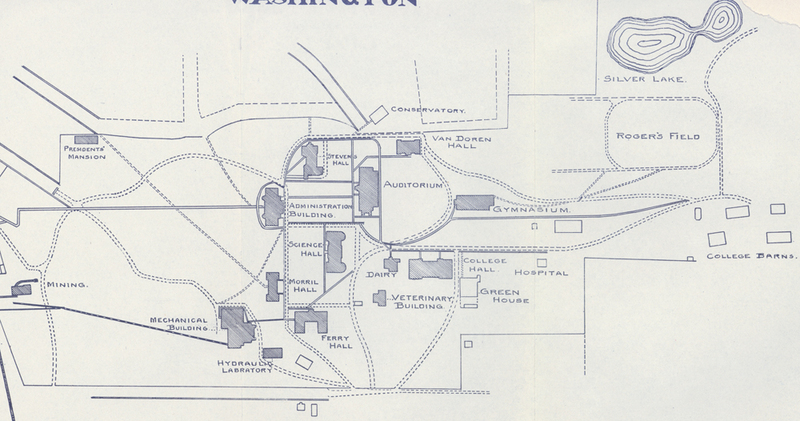 Some of Dr. Neil's preliminary work for this can be found in MASC (Cage 1828) in his 1965 typescript From cabbage patch to College Hill: the architectural development of Washington State University to 1905. Current Pullman Campus in 3D. For a more complete list of active campus buildings, see Capital Planning and Development's Facility Roster. Capital Planning generally denotes buildings by their "date of acquisition" and thus generally denotes when buildings were begun rather than completed. As such, dates may contradict dates on this page (which are generally completion dates). Please note that due to the nature of how this document came about, dates should best be considered approximate - this document is intended as a starting point for researchers, not an endpoint!